The wet conditions during spring planting left a lot of land unworked. Some corn and soybean growers put buckwheat into land that could not be planted in time for the intended crop. There were quite a few first-time buckwheat growers this year. A number of regular buckwheat producers who use land that is late to dry found that they could not plant at all. The dry summer hurt anyone who had worked fields wet because that reduced the amount of water available to crops once the soil dried. The fine root system of buckwheat had trouble growing through hard soil in some of those fields. Elsewhere, heavier soils retained enough moisture for buckwheat to grow well and to respond to any small rain showers. 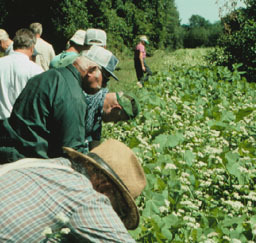 The 2002 Northeast Buckwheat Field Day was held on August 27. Thanks to Norm Wigfield for hosting the field day on his farm in Clyde, NY. Seed. Cliff Orr of Birkett Mills spoke about the new contract that will apply to Koto. Because of the intellectual property restrictions on this variety, The Birkett Mills will provide seed for planting, but will retain ownership not only of the seed provided but also of the seed produced. Growers are paid by the amount of seed they deliver. They will be required to deliver all the seed that is produced. The new arrangement is called a "total production contract." The total production contract is a new way to protect a variety and to recoup the cost of developing it. In some ways the difference is small, you still get paid for what you grow. But the ownership structure is a significant change, and one that has been controversial. Buckwheat is one of the first crops where it will be a standard practice. 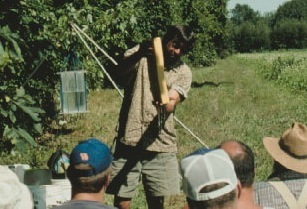 Bill Pardee of Cornell's Plant Breeding Department told of the importance of using various new techniques, such as this one, to bring money back to public breeding programs. If that doesn't work, public breeders will not be able to bring new traits and varieties to the farmers they try to serve. Soil. 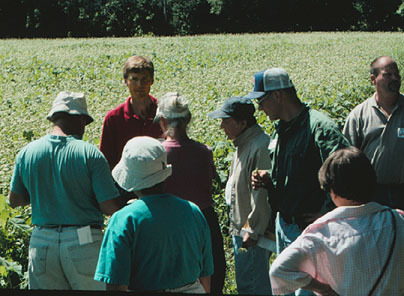 Bob Schindelbeck of Cornell's Crop and Soil Sciences Department spoke about soil quality. Buckwheat is known for its ability to make a more friable soil, and for its demand for good tilth to germinate well. Bob went through key steps to better tilth. An essential thing for tilth is to have large air spaces that allow water to drain. He demonstrated the drainage with a regular sponge with big air spaces and a fine pored sheetrocking sponge. The regular sponge drained the excess water quickly, but the other sponge remained completely waterlogged when held on end. If gravity can quickly bring the field down to field capacity, there is a lot more time when the field is at a good moisture for working, and when crop roots can get air. The way to get large air spaces is to allow large soil aggregates to form. They are held together by glues formed by bacteria, fungi and certain plants (including buckwheat). Feeding these organisms with fresh organic matter every year will keep them producing the necessary glues. Maintain the aggregates by working the soil only when they hold together. If it is too wet, they press together. If it is too dry, they crush apart. Cultimulchers and harrows spare the aggregates much more than do disks. Bob also showed the familiar way that a soil gets "addicted to tillage." If the ground is worked too wet, the subsoil becomes compacted and the surface is cloddy. To be able to plant, the grower has to crush the clods with a disk or roller. Now the aggregate structure is gone, so the soil crusts quickly after a rain and needs more tillage. The compaction layer below prevents the soil from draining, so the grower is back out on a field that is too wet to tolerate the equipment. This addiction is common, and well worth breaking out of. Buckwheat can play an important role because the ground can be worked when it is at optimum moisture, it keeps the ground protected from raindrop impact, and it helps rebuild aggregates. Bob had a portable rainmaker that shows how well soil holds together in the rain. Many soils will turn to mud if they get an inch of rain in 15 minutes. Healthy soils can handle much more without breaking down. Norm Wigfield has been concentrating more on soil quality since converting to organic production. He was pleased--and others impressed--when a shovelful of his soil stood up easily to the equivalent of a 12 inch rainfall over an hour. The soil aggregates held together and the water drained between them in this heavy Wayne County soil. Canadian buckwheat plantings are down to 27,000 acres in 2002 from the recent levels around 35,000 acres. Decent projected yields mean expected production of 13,000 metric tons, selling at about US$9.50/100 lb. In 2000, the USDA Food for Progress program attempted to buy 10,000 lb of buckwheat as food aid to Russia. There was not that much extra buckwheat available in the US, so the quota was not filled. Buckwheat storage did empty out considerably, however. In 2001 and 2002, the program had more modest goals of 1000 tons per year, which they have successfully met. The current purchases are mostly going to Ukraine. Ukraine is a traditional producer of buckwheat, but now production is only at about 200,000 tons per year. In comparison, Ukraine will produce 21 million tons of wheat this year, up from 10 million two years ago. When Ukraine became independent, it took several years to establish a national currency. During that time, many farms raised buckwheat because that is how their workers preferred to be paid. A research group at Kagawa University in Japan has shown the buckwheat tolerates the high aluminum levels in acid soils by detoxifying it. Buckwheat binds the aluminum to oxalate and isolates this chemical complex inside the cell's vacuoles. This discovery promises to focus more attention on buckwheat in the effort to make the world's acid soils more productive. We have some of those soils right here in the Northeast, and buckwheat often does well on them. The distribution of buckwheat roots is a matter of considerable interest. They are so small that it is hard to know where they actually grow. Dr. Murakami's group at Nagano, in Japan's prime mountain buckwheat region, found that root growth is rapid until the peak of flowering, then it stops. The concentration of roots is highest in the top 8 inches of soil. And that is in the relatively loose volcanic soil of Nagano. We know that the roots are fine. These scientists found that one ounce of buckwheat roots has a length of 22 miles! Typically there are about 5,000 miles of buckwheat roots per acre. Longtime NBGA member Carl Kahkonen of Trumansburg is considering a buying trip to the Midwest for swathers and pickup heads. Growers there are either getting bigger machines or getting out. There is some nice modern equipment at auction that fits the Northeast well, and that is attractively priced. Call Carl at 607-387-3111 if you'd like him to be on the lookout for something for you.